Water walls are an option that uses tile that coordinates with the waterline of the pool on a raised wall that enriches the focal point of that area. These walls can have a tile or stone-like appearance. The stone-like selection is often made of fiberglass. This reduces the weight and cost of construction. Fountain bubblers are another feature design that offers the visual and audible characteristics of water. Also called foam or sun jets, these are like small geysers that shoot water up from floor of the pool. These are typically placed in shallower areas of the pool, like sun shelf or baja deck. This type of water feature needs to be installed during original construction. Pool rock waterfalls are a larger water feature option that provides cascading waterfalls as a beautiful background for a lagoon-style pool, that also produces great ambience. These waterfalls, depending on their width and height, can also block any neighboring view or noise, adding more privacy to your pool area. LED lighting is another great way to enhance the atmosphere around your pool and bring your water features to the next level. LED lights can allow you to customize and augment your pool and its water features. They also create an excellent evening atmosphere. Whether you opt for strategically placed landscape rocks, colorful in-pool lights, or a combination of both you can provide a unique setting. 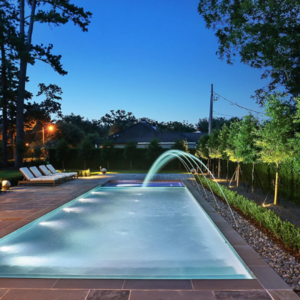 Lucas Firmin Pools builds custom designed pools in the Baton Rouge area, and can bring your water feature dreams to life.